Koh Samet Hotels, Beach Bungalows and rooms. Koh Samet or Ko Samed (as it is sometimes spelt) is situated in the Rayong Province, it has 14 main beaches on the Island. Being a Thai National Park it costs 400baht for foreigners to enter. The weather is tropical and the beaches are warm and sunny all year round. Average temperature is 23-33 degrees celsuis. The best weather is between October to May with clear skies and sunshine everyday. June to September there maybe some light rain. Ban Phe is the ferry point to get to Koh Samet, there are direct ferries to Vongduern Bay 3 times perday, 9.30am, 1.30pm and 5pm, you can also get a speed boat to take you across for around 1,000baht, the ferry costs 70baht and takes 45 minutes. Getting to Ban Phe takes about 2 hours to get to from Bangkok or an hour from Pattaya, there are many options on how to get there including minibus direct, or State buses to Rayong then a Sawngthew to Ban Phe which is a 14km journey. If you drive to Ban Phe you can leave your car in guarded parking for around 60baht perday. To NaDan which is the main ferry point on Koh Samet the ferries leave every 30 minutes, the cost is 120baht return although you can buy a single ticket, there are at least 5 piers in Ban Phe,Nuanthip Market pier,Hong Yen pier,Phe pier,Chok Krisda pier which goes to Samed Cliff Resort and Sri Ban Phe pier. Want to learn more about Koh Samet? 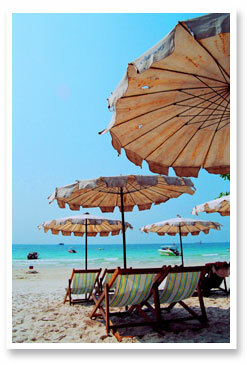 Why not check out our Eastern Thailand & Koh Samet Forum. Vongduern bay means moon crescent bay in Thai. Malibu Garden Resort has its own minibus service from Pattaya to Ban Phe for 230baht per person each way. Room Rates start from 1,550 to 3,000baht per night. 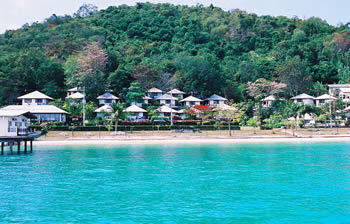 The only boutique four-star resort of Samed Island. Le Vimarn Cottages on tranquil beach of Ao Prao, can be counted a new alternative for sea lover who prefer enjoying precious holiday in style. Simple but elegant, lovely cottages on stilts with thick thatch roof equipped with modern facilities are ideally designed to be doted around on small slope, hidden among private world of tall tropical trees in front of the tranquil sandy beach of Ao Prao. Clustered on the gentle slope of a hilly cove overlooking a quiet bay beach is your stylish retreat from the world. Supremely comfortable individual cottages all with balconies, some with your own outdoor spa that look down onto a peaceful curved bay of sparkling sea and fine sand. The cottage cluster centers around a superb infinity pool, a world class spa and a restaurant offering a most interesting and comprehensive menu. Le Vimarn attracts sophisticated and discriminating international guests year after year. A dream location that will last in your memory for a lifetime. For the active holiday makers … Sailing, windsurfing, snorkeling, diving, fishing, boating, sunbathing, swimming, bike riding or relaxing in your own tropies style cottage set in luxuriant greenery. A vacation on a tropical island has never been better than this. Ao Prao is a resort village located on a secluded beach with spacious cottages , first-class facilities, fantastic food and accommodation that offers real style, comfort and warmth. Here, you are miles away from everyday worries with all the beauty and wonder of a tropical paradise. This is the perfect vacation spot for couples or families and also offers modern facilities for a company seminar or conference for up to 70 delegates. Ao Prao is a tropic island vacation resort that is beyond your expectations. Experience the senses of the nature of Limacoco, sea breeze, blue sky, and crystal clear warm seawater, all can be a simple click a way from your dream holiday. Room Rates from 2,500 to 6,900baht per night. 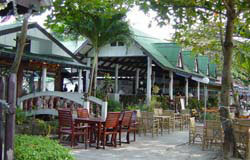 Jep's restaurant is set on Sai Kaew Beach and offers the finest food the island has to offer. Internationally recognized for its excellent range and quality. Sea Food , Thai Food , Italian , Mexican , and Indian dishes . Jep's pride and joy is in the fact that all of the pastries breads,croissants,brownie cakes and a range of other baked items are made fresh in our own kitchens on the island. Fresh ground coffee is available on Jep's beach. Other coffees available are cappuccino,latte, Irish,expresso to name a few any time of day or night. Also Thai Cooking classes are available here. Room Rates from 600 to 2,600baht per night. Room Rates from 3,900 to 12,900baht per night. All 40 rooms are designed to offer you easy living by the sea among natural beauty, therefore, large windows in each room allow you to admire tropical garden or the beach right from your bed. Room Rates from 2,450 to 10,500baht per night. Saikaew Villa, Samet Island, with beautiful beach and tranquil tropical garden is the perfect place to escape for a few days of beach side relaxation. Just 30 minutes by boat from the coast of Rayong, you will be able to experience the charms of nature that combines the beauty of silver sand with the garden of tropical trees. This unique setting not only provides you with a rue sense of natural beauty but also provides your necessary comfort. Saikaew Villa offers a variety of bungalows fully equipped with 24 hours electricity and water supply which is designed to blend in with the beautiful natural surroundings. Our restaurant serves superbly cooked seafood to add to the feeling of a tropical island which cannot be found elsewhere in the world. This comfort and enjoyable atmosphere can be yours at Saikaew Villa. Room Rates from 700 to 2,550baht per night. Samed Grandview Resort at Had Saikaew Samed Island with beautiful beach and tranquil tropical garden is the perfect place to escape for a few days of beach side relaxation.Just 30 minutes by boat from the coast of Rayong. You will be able to experience the charm of nature that conbine the beauty of silver sand with a landscape of tropical trees. Room Rates from 800 to 6,000baht per night. Visa and Master card,American Express,Diners club and accepted. 1.Local boat : Boat trip around koh samet inc. fish farm visit - 400 Baht. 2.Speed boat : Boat trip to koh talu and koh kudee inc fish farm visit - 600 Baht. 3.Speed boat : Boat trip to koh Munnai inc. turtle farm visit - 1,000 Baht. Room Rates from 450 to 2,600baht per night. The name " Paradee " means the “ Sixth Heaven ” … absolute … luxurious … splendour … in a private world complete with your own pool and romantic outdoor bath. We offer you not one, but two secluded Palm-fringed beaches … one dazzling white in the sun with crystal aquamarine waters … the other abundant with coral. Truly a lovers ' paradise, Paradee Resort & Spa is the only resort in Thailand with beaches on both east and a west coasts. You can watch both the early morning sunrise and the spectacular sunset in one scenic location … the experience you will never forget. Please note that the Paradee is designed as a "couple- resort" and is already renowned and treasured for its tranquality and its "away-from-it-all" location. Therefore the resort is not especially suitable for (small) children. Room Rates from 10,600 to 76,000baht per night. 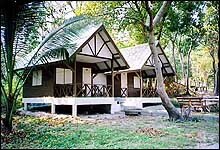 Since 1981 we are running Tubtim-Resort, which we started with 10 bungalows built from bamboo at that time. As well we established the meanwhile well known, and for the brilliant food famous, restaurant. According to the beloved style of the island, staying there was very puristic, sharing a public shower, while enjoying the nice and quiet white sand beach in middle of the palm trees. Already two years later we decided to built the bungalows from wood, and encreased the number to 15. Within this renovation we established the first water supply system enabling us to provide private showers and toilets for each bungalow since 1983. The fresh water has to be brought all the way from the mainland by boat since, and is still stored in a local tank for permanent availablity. After a couple of years, as the utilisation demanded it, we raised the comfort by setting up generators in 1991 to have electricity for the restaurant as well as for all bungalows, giving us light on a switch and ceiling fans for the hot nights. Happily we built our still existing, but meanwhile modified, beach bar in 1992, followed by the BBQ-corner in 1996, which finally gave us the possibility to serve our customers right at the beach, what greatly pleased them ever since. Our huts offer exotic comfort, though our policy is to let you experience a TRUE-NATURAL way of the Island's life-style. We have many types of rooms available, as we wanted to make sure to meet your requirements at best. We have 2 types of room styles which is a wooden-type and a building-type. Both provide normal electrical fan as well as air-conditioned to suite your needs. Our prices are starting from THB 600,- up (per day charge for 2 persons). Please contact us directly for availability and pricing. NOTE: * Air-condition can only be used from 5:00 pm.-10:00 am. ONLY (Due to our energy-saving policy). Nimmanoradee is the name of one of the paradise classes. We intend to present to all guests to feel comfortable when being here. 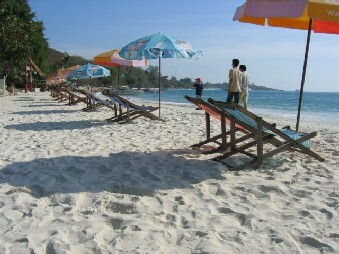 The location of the resort is at the end of Samet Island, so called "Ao Pakarang". We are the best place of snorkeling, sunset watching, fishing and definitely staying here with the warmest service like a paradise. The Boat of Nimanoradee only have one trip a day at 12 AM. from Nuan Thip Pier - the resort and Nimmanoradee Resort -Nuan Trip Pier about 2 PM. 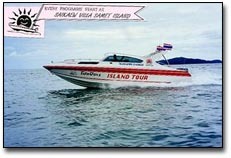 150 Baht/one way/person - 1 hour or Speed Boat 1,500Baht /one way (max.10 person )-20 minute. Located on Ao Lukyon which is a rocky beach. Room Rates from 1,000 to 1,500baht per night. The design of the Resort focuses on the strong axis within the layout and paths. experiencing then a feeling of familiarity with the environment combined with a great potential of discovery. Since the dream became reality but had to remain so, the two creators decided to build only 24 luxury bungalows, providing everyone with extensive space and creating the exclusive mood of the Resort. Mooban Talay Resort is equipped with all the modern facilities that will contribute to a complete relaxation experience during your stay. Furthermore, the individual and friendly attention given to each guest shall make you feel part of our "village". Once arrived, our Resort boat will transfer you to the Resort's private pier on Koh Samed. Or if you prefer, regular ferries to Na Dan village are available all day, here taxis drive you within 5 min. to the Resort. Mooban Talay Resort is remotely located at the far end of Noina Bay (Ao Noina) at the top North side of the island. The sea is nearly wave less all year round. The white powdery sand beach offers a beautiful view to the coast from Ban Phe till Wang Kaew and the islands of Koh Platin, Koh Kruai and Koh Kudi. Samed Island is a small beautiful island in the south-east vicinity of Bangkok (200 km), in the area of Rayong district. The island is famous for its magnificent beaches and for the well-known poet, Sunthornpuh, who wrote a poetry about this place. Parts of Koh Samed belongs to the National Park Kaow laem Ya. 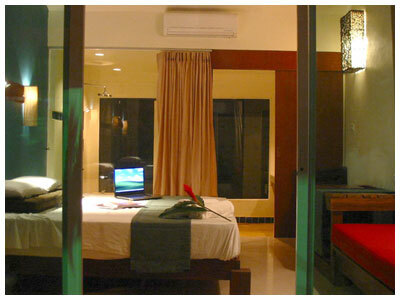 Samed Villa Resort is located on the white sandy Ao Phai Beach on Koh Samed. It was built in 1987. The bungalows and restaurant were developed under the management of the Swiss owner Josef Ottiger successfully over the years. The bungalows are exquisite, comfortable and belong now to the very best accommodation on the island. We would like to invite you to relax and enjoy your precious time at our Samed Villa Resort at a reasonable price. We look forward to welcoming you at our Samed Villa Resort. the breakfast Buffet with coffee and tea, fruit juices, fresh baking as well as many additional European ones and Thai preciousness, It does not leave any desires open. Room Rates from 1,400 to 4,200baht per night. 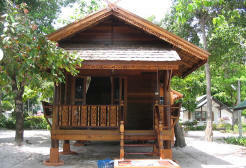 Huts available from 500 to 2,000baht per night. place to party at night. The clear turquoise sea, its white sand beach and the traditional Thai massage is what makes Silversand such a great place to visit. At night with its amazing fire show, disco and bar, the nights entertainment is not something you want to miss.Travelers, tourists and locals come from all over the island to enjoy the atmosphere at Silversand. There is always a large mix of nationalities here, which makes for a fun stay for everyone. Everything in the resort is within easy reach, so you can lounge around at your own pace. We love welcoming our guests to Silversand, as we know they will have a great time during their stay with us. Seclude yourself in our resort, which located on Ao Wai, one of the stunning, unspoiled, private, white sandy beach of Koh Samet National Park, occupying 11 acres of landscaped hillside and beachfront by the Gulf of Thailand. Samet Ville Resort is the perfect vacation hideaway for couples, retreats, and families and the ideal retreat for sun, sea and nature-lovers and those seeking a complete escape from the distractions and pressures of life. Samet Ville Resort sets along two private beaches, Ao Wai and Ao Hin-Kleang, combines a magmificent location with authentic Thai ambience. While enjoy the white sandy beach on Ao Wai, the crytal clear water and coral reef can be explore on Ao Hin-Kleang. Offering 69 guest rooms or 44 cottages, within a relaxed, casual atmosphere. An abundance of recreational opportunities are kayaking, sightseeing, snorkeling, scuba diving, fishing, hiking, sunrise and sunset watching, and bird watching. Experience a world of relaxation in our low density rustic beachfront, and seaview-hillside cottages and enjoy the natural beauty of our spectacular setting. 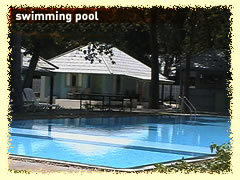 The prestine beach and heavily forested site is ideal for family vacation and romantic getaway. Room Rates from 1,100 to 13,900baht per night. Room Rates from 2,800baht per night.